Mr. Andresen, the Chairman and owner of Ferd, introduced the six honourees at a ceremony at Norway House in Brussels jointly hosted by Ferd, JA Europe and the Ambassador of Norway to Belgium. Honourees were asked to reflect on the definition of entrepreneur in today’s world. “Being an entrepreneur means not having to wait around for someone to hire you. Not only can you create your own job, you can create your own industry!” said Alicia Navarro. “For me, being an entrepreneur is all about the spirit to change things for the better. When we decided to found ‘Talentify’ a couple of years ago, it was clear and the only way for us to put impact first and do it as a social business. I deeply believe the time to become a change-maker is now and who, if not we as entrepreneurs, are in the front run of building a sustainable and livable future for the generations to come,” added Bernhard Hofer. “Mentors are an integral part of the journey! They will help you solving quests faster and support you in difficult times. As an entrepreneur, you should count on a wide network of mentors in order to get different opinions. But the decision can only be done by you,” complemented Daniel Bartel. “These young entrepreneurs can inspire European youth to follow their example, creating jobs and value for society. By value we mean far more than just financial return – value is also created through personal development and growth. Just as I have been, the next generation will be inspired by them, and so will our politicians, the business community, the education community and even parents,” Johan H. Andresen, concluded. “We reached 4 million students in 2017-2018, but we know there is still a long way to go. We estimate that not more than 15-20% of students in Europe have access to entrepreneurship education at their school,” says Caroline Jenner. Ferd is a family-owned Norwegian industrial and financial group that is an active and long-term owner of strong companies with international potential and an investor in a broad range of asset classes. 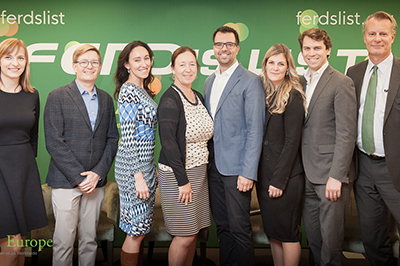 In addition to the group’s purely commercial activities, Ferd has a strong record of involvement in social entrepreneurship and micro finance.